Justin Bassett, who says he is an avid player of Electronic Arts' extensive line of sports games—or at least he was until he learned of its treachery—sued EA in the Eastern District of New York (but alleging violations of California law) on July 24. Justin alleges he bought a number of EA sports games over the past five years or so, relying "upon the representation that these EA games were enabled for online play…." Were said games enabled for online play as represented? Indeed they were. But, Justin says, it turned out that this was only true for a limited time, and thus he did not receive the full benefit of his bargain. Therefore, lawsuit. For those not familiar with such games, here's an example. I personally own, I believe, Madden NFL 08, depicted here (I have the PS3 version). It is a game in which one can control the actions of simulated football teams, although in my case "control" is probably not the right word. These simulated teams are made up of simulated players based on the actual players on the NFL team's roster at the time. This, for whatever reason, is part of what makes this particular game enjoyable, at least to me. The series is hugely popular, and as you might expect, EA sells not only games based on pro football but also college football, as well as hockey, basketball, and even "sports" such as golf and that one where people don't or can't use their hands. And they sell new versions every year. That last item is the diabolical practice that Justin is now fighting. You see, when a new version is released, many players go buy that new version. Most likely this is because, as suggested above, they enjoy the game more with current team rosters or at least current players (if they draft their own e-teams). The problem is that NFL teams insist on changing their rosters every year. Sometimes, players even retire. For example, who is that guy on the cover of Madden 08 anyway? 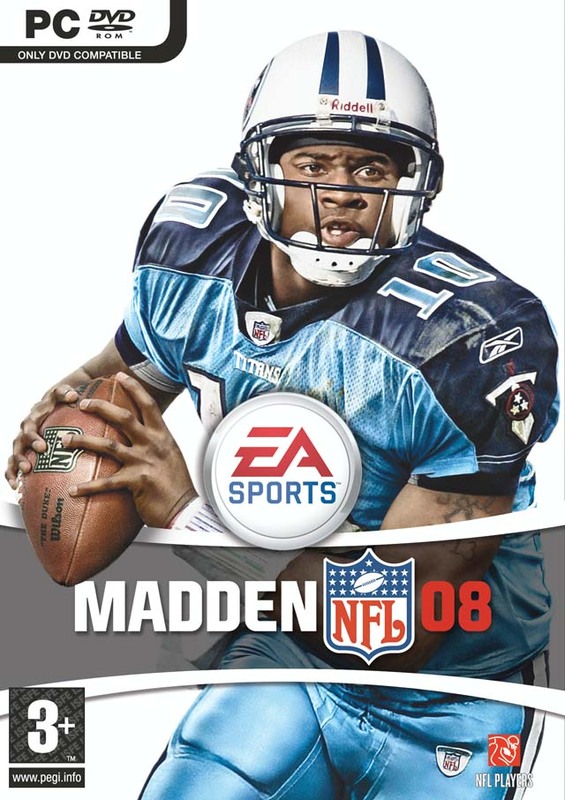 I guess he played for the Titans once, because there he is on the cover in a Titans uniform. Research shows this to be Vince Young, a fantastic college QB and significantly less-fantastic pro QB, who it turns out no longer plays football anywhere (unless he is playing Madden at home, if he still has a PS3, or a home). Thus has the value of my Madden 08 been greatly reduced. Indeed I would say it has been reduced to zero, since I have no idea where it is and would have no interest in playing it if I found it. Nor would anyone anywhere have any interest in playing Madden 08 against me online. It is a somewhat topical game that is now five years old. Since no one plays it online, EA no longer supports online play for it. It has also discontinued online support for, just as a few examples, EA Fantasy Football 09, NHL 07, MVP Baseball 2005, TimeSplitters 3 for PlayStation 2, Spore for iPod, or online Boggle for Palm devices (the "Palm" was a form of iPhone without the phone). So, yes, if today in 2013 you would like to play online Boggle for Palm devices, you will not be able to do that, partly because EA no longer supports it, but also because THERE IS NO OTHER PERSON IN THE WORLD WHO WOULD PLAY ONLINE BOGGLE FOR PALM DEVICES WITH YOU. And here is the true stupidity of Justin's case. He says he should now get some or all of his money back because had he "known at the time that he would not be able to play the Products online after a certain period of time, he would not have purchased the Products" or would not have paid as much. Because the games are not "enabled for online play indefinitely—or, at a minimum, a reasonable time from the release date," EA is guilty of misrepresenting them. (Emphasis added.) Indefinitely! Now, if EA released an online game that couldn't be played online, or it terminated support almost immediately, that might be a different story. The games are relatively expensive and the online feature certainly has value. But according to EA's website, at least, the most recent games no longer supported were released for the 2011 seasons (and so likely came out in 2010). The most recent game this guy alleges buying was for 2010. Since, again, sports teams fiendishly tend to change their rosters every single year, a two- or three-year lifecycle can hardly be unreasonable. Is that an issue of fact? That's what the plaintiff will argue, while demanding a lot of expensive discovery in order to figure that out—although that could all be avoided if EA agrees to settle, of course.